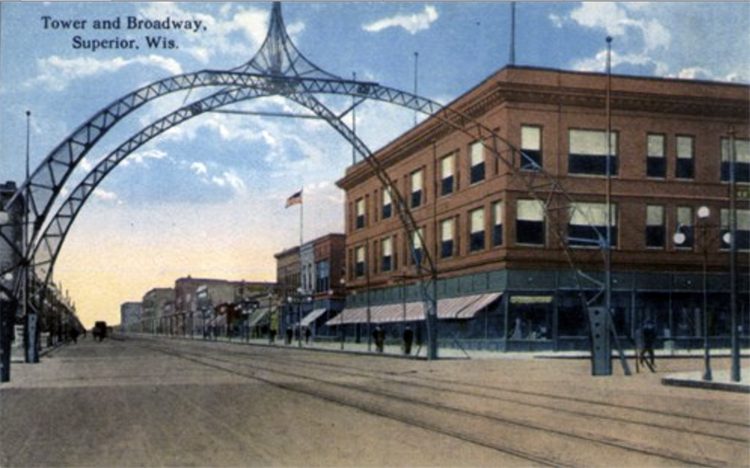 The Grand Army of the Republic consisted of Union veterans of the Civil War, and in 1900 the Wisconsin GAR lobbied the city to build a monument for their upcoming convention in Superior. At the intersection of Tower and Broadway, four curved steel shafts rose from each corner and met thirty-five feet above the street. A twenty-foot centerpiece sat atop the arch, and a thirty-six-foot flagpole topped that, creating a monument reaching ninety feet in the air. At one point the arch contained 220 light bulbs, which were lit just four hours a night (it cost $1 an hour to keep them lit). Unfortunately the arch rusted and was scrapped in 1921 (the mayor also wanted it gone…).